Susan Straight talks with contributing editor Luan Gaines about the final novel of her Rio Seco trilogy that started with A Million Nightingales and continued in the acclaimed Take One Candle, Light a Room. Interviewer Luan Gaines: “There are two kinds of people, those who leave and those who stay.” In Take One Candle, Light a Room, we meet Fantine, descendant of Moinette (A Million Nightingales). Between Heaven and Here gives an intimate portrayal of the beautiful, doomed Glorette and the impact of her death on her family. Is Glorette “the one who stays”? In different circumstances, would she have left? If so, where would she go? Susan Straight: In my mind, Glorette’s life was irrevocably changed when she became beautiful, and I was trying to write about how two girls become such different humans because of beauty and the world’s perception of what a beautiful woman is or might be. I realized her father noticed Glorette’s face changing, and then her mother and they were both frightened by it. And one of the first lines I ever wrote, fifteen years ago, was Victor remembering after his mother was killed that her father had kept saying she should go get a secretary job downtown, and she responded that a man would bother here there, too. I think it’s a good question—she doesn’t leave because her world stops when her lover is killed, and she thinks he abandoned her. Maybe she believed he would show up again. The original Sarrat in Louisiana links the Picard and Antoine families from A Million Nightingales and Take One Candle, Light a Room and the new Sarrat in Between Heaven and Here . Can you share a little of the events in Louisiana that inspire the move to the bountiful groves of California? The two boys, Enrique and Gustave, survive the aftermath of the 1927 Mississippi River Flood on the levee, when Gustave kills a pig, then feeds the first piece of meat to Enrique after both their mothers have died. When I began with that image, I realized that they could be descendants of Moinette Antoine, who was sold away from her mother south of New Orleans and brought to sugar cane country outside Baton Rouge. But in Plaquemines, where Enrique and Gustave are taken back to their aunt, oranges and satsumas are grown, so when Enrique gets out of the military after World War Two and sees all the orange groves in California, he feels something instinctive. And he does something terrible to own that grove. How do former classmate Sidney Chabert’s memories of the younger Glorette color his reaction when he meets her by chance in the hospital where he works? Even in her diminished condition, what is the value of Glorette’s recognition to Sidney? He’ll never get over being in love with her—and that’s part of the beauty thing, but also because he’s just that kind of guy. Sentimental, and soft. What was your inspiration for the image of Glorette’s death, an addict /streetwalker tossed into a shopping cart in a trash-strewn alley? Fifteen years ago, a young woman was killed and her body left in a shopping cart on the corner of my father-in-law’s one block street and the major avenue where I drive every day to work. My brother-in-law saw the cart and thought it was discarded clothing inside. When the police arrived, the girl’s mother lamented that no one would care who killed her daughter because she was just a pregnant black girl—she was right, in that no one really pursued the case. The girl was killed in retribution for something her boyfriend had done. I never forgot that mother’s anger. When Sidney discovers Glorette’s body in the shopping cart, her long hair twisted around the handle, why can’t he leave her in the alley? What are the potential consequences of taking her home to Sarrat without notifying the authorities? It’s illegal, and wrong in many ways, but he doesn’t want her body cut up and made fun of, and he knows police are likely to call the killing NHI, No Human Involved, so he just panics and takes her body to her brothers. That’s crazy. Enrique Antoine isn’t necessarily a violent man, but he has killed before. Under what circumstances does Enrique feel it is justifiable to take the life of another? Is Glorette’s death one of those instances? I wanted to explore what it might be like for the kind of man who had killed people under what he thinks of as justifiable consequences, but whether that still makes him a serial killer, since it has happened repeatedly. I think one of the most important parts of the book is how he originally feels he needs to kill whoever killed Glorette, and what actually happens. How does Enrique’s wife, Marie-Claire, feel about being left alone with a dead body on the couch in her living room, her grandchildren sleeping down the hall, while the men look for the killer and prepare for the burial? She feels sad, and incredibly lonely because her own daughter Fantine is so distant and estranged from her, and here is Glorette, who’s had this tragic life, and there’s the intimacy of touching her, and loving her, in this house where they were both children. “Those girls supposed to be safe.” I found this one of the most powerful sentences in Between Heaven and Here . Can you speak to the contrast between this intention for Sarrat and Glorette’s tragic ending in an alley? Has the promise of the new Sarrat succumbed to the attrition of poverty and the decay of Rio Seco? Do Gustave and Enrique accept this reality? This is a great question, and something no one else may have noticed. For Moinette, in Nightingales, her beauty gets her sold away from her beloved mother, and the tragedies that happen to her are because no one can protect her until she’s with a man who is gay who loves a man who is Jewish, and they provide her with some protection. Then, in Sarrat, the girls are hunted and their families respond by sending them away. It’s still about beauty and power. For Glorette, the next generation of beauty also has tragic consequences, and I wanted to write about how sometimes coincidence is the most dangerous facet of life. Fly shows up in the alley in Rio Seco with her New York ways and her pimp, ostensibly on their way to somewhere else. Fly hates Glorette from the beginning. What is the source of this animosity? She wants business, and she’s the wrong woman for this alley in this city, and she takes it out on Glorette—and there’s also the color thing. Like Glorette, Clarette remains near her family to raise her children, driving an hour to Chino for her job at the California Youth Authority. How does her work impact Clarette when considering her own children’s future? She gets resentful of Glorette’s shrugging off of motherhood—but she likes to remember their childhood, and she also loves her children so much that she can’t do anything but think of their happiness for the most part. Though it is the catalyst for Between Heaven and Here , Glorette’s death is inconsequential in the scheme of things in Rio Seco, but for those who have particular memories of the beautiful, lost woman. What is Glorette’s legacy? Maybe just that—memory, a vision, an image, a defiance. Victor is as single-minded as his mother, Glorette, but his passion is for learning, not the oblivion of the pipe. How does Victor cope with Glorette’s death? How critical is his grandfather to Victor’s development as a man? He’s the savior. Along with Gustave and Enrique, Marcus Thompson is the hero who will save Victor, and even his uncles come through. I wanted to show that Victor couldn’t have survived if they hadn’t pulled him up—which is how my own family operates. The title for Between Heaven and Here comes from a line spoken by a character in the cable series The Wire as Bubbles, a soft-hearted junkie says, “It’s a thin line between heaven and here.” How does this sentence symbolize the existence of the characters in the novel? Is this statement more accurate for this novel than the others in the Rio Seco Trilogy? I love that line. I just went to Baltimore this weekend, for the first time, for a book festival, and got to walk around the streets where Bubbles said that. I heard it, and thought it was perfect for all the characters, but especially for Glorette, who likes to look up at the moon and the trees, and who teaches Victor to do that. When you wrote A Million Nightingales, had you already decided on a trilogy, or did the novels evolve from one another? If it was your original plan, were there particular problems in writing a trilogy? Can each of these novels—A Million Nightingales, Take One Candle, Light a Room and Between Heaven and Here —be read individually, or should a reader begin with the first and move through the others? I wrote the last chapter in Heaven first, with Glorette dead and Victor with his grandfather in this little house, trying to figure out how to stay alive. Then I had to find out why his mother was so sad, and then her own mother showed up, and then the ancestors showed up. So I wrote Nightingales, to explore that mother and son, and then Take One Candle, because I was obsessed with Fantine leaving her own mother, and then came back to finish Heaven. I consider them companions—like the work of Marilynne Robinson and Louise Erdrich—and they can be read in any order. I have been a fan since I Been in Sorrow’s Kitchen and Licked Out All the Pots. Only years later did I learn you weren’t African-American, as I had assumed. What is your readers’ most common response to this information? What are new fans most intrigued by in your novels? This doesn’t come up very often! Have you begun to work on your next novel? Can you share something about it with our readers? Haven’t started yet—working on some essays. When you’re frustrated, listen to music, look at books of photography because that medium of art is so different from writing and then close your eyes for a few minutes. 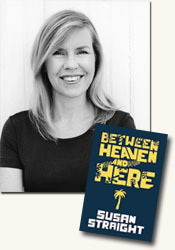 Susan Straight’s new novel, Between Heaven and Here, is the final book in the Rio Seco trilogy. Take One Candle Light a Room was named one of the best novels of 2010 by The Washington Post, The Los Angeles Times and Kirkus, and A Million Nightingales was a 2006 Finalist for the Los Angeles Times Book Prize. Her novel Highwire Moon was a Finalist for the 2001 National Book Award. Her short story "The Golden Gopher" won the 2008 Edgar Award for Best Mystery Story. She has published stories and essays in The New York Times, The Los Angeles Times, Harpers, McSweeney’s, The Believer, Salon, Zoetrope, Black Clock, and elsewhere. She is Distinguished Professor of Creative Writing at UC Riverside. She was born in Riverside, California, where she lives with her family, whose history is featured on susanstraight.com. Contributing editor Luan Gaines interviewed author Susan Straight, author of Between Heaven and Here (see accompanying review), about his book for curledup.com. Luan Gaines/2009.